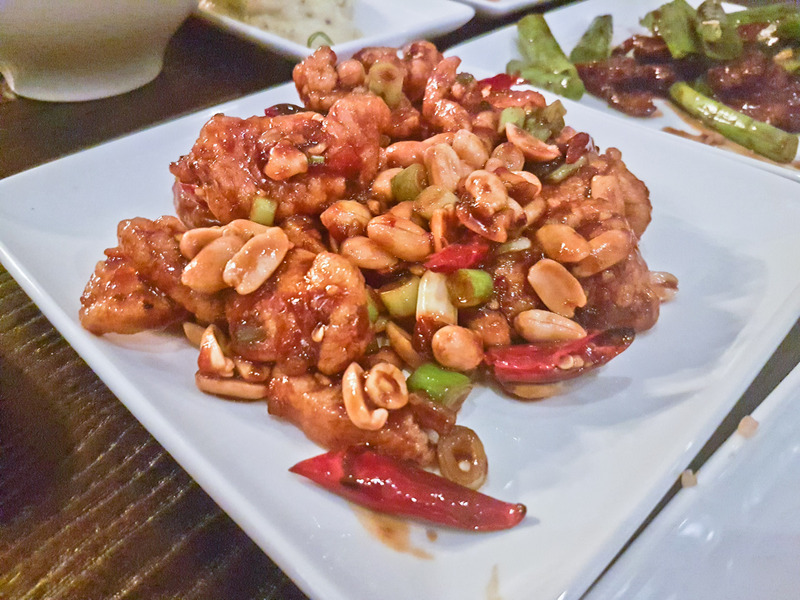 When I went to Dubai last year and asked for restaurants recommendations the most popular suggestion was always the same PF Changs, the recommendation always came with the words “must try the Dynamite shrimp”. So I went to Dubai, tried it and well, I didn’t really get the fuss personally!. Anyway, the good news is you don’t travel to Dubai to try it because there’s one that’s recently opened in London! 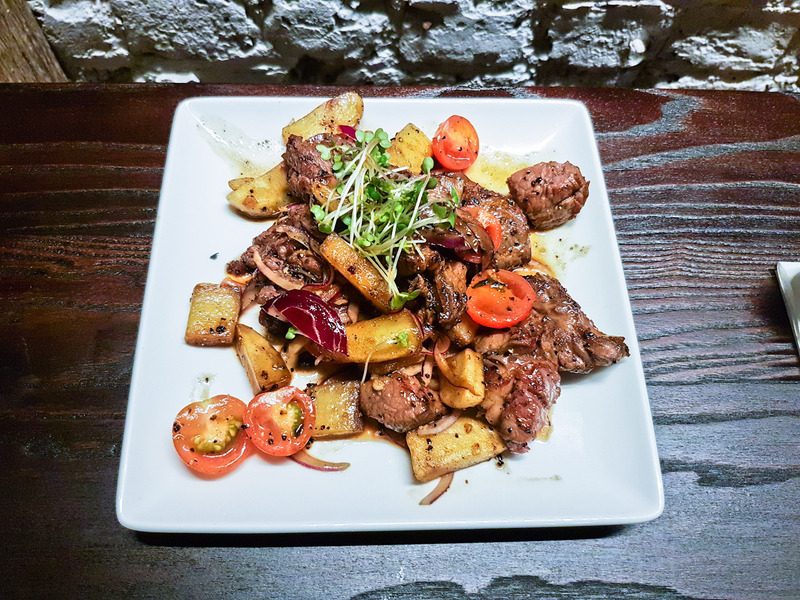 The even better news is that due to demand, they now serve halal meat, chicken, lamb and beef and with pork dishes cooked in a separate area in the kitchen. 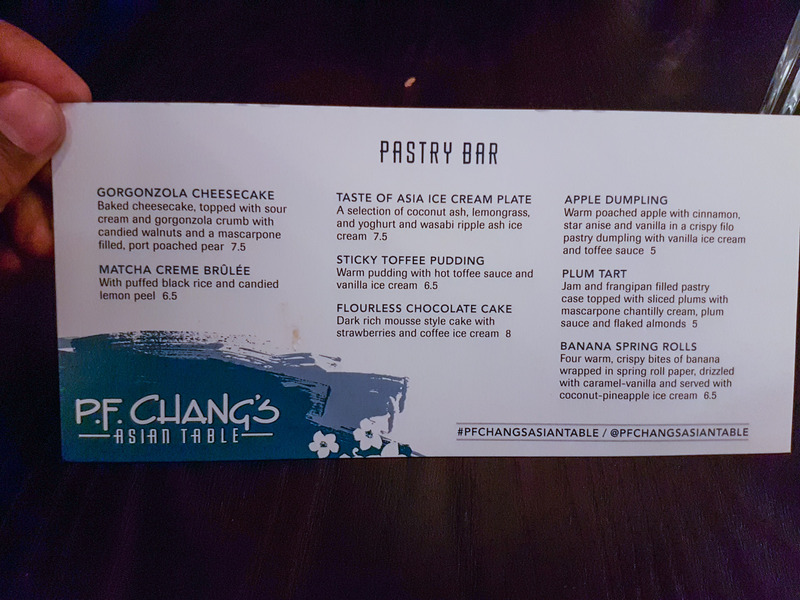 Walking into PF Changs, you may not experience the same buzzy atmosphere you would expect from the Dubai branch, but the ambience doesn’t disappoint. This London venue doesn’t have the most romantic feel due to the brighter lighting and open spaces, but it is an ideal place for a fun gathering with friends. With an open kitchen and Japanese art on the walls, this PF Changs is a bit quirkier than its Dubai equivalent. There is a table at the back of the restaurant with stools accommodating groups of people creating a more playful atmosphere. The lack of music is noticeable, especially when surrounded by groups of people, but this doesn’t take anything away from the venue. Always imitated, never duplicated. 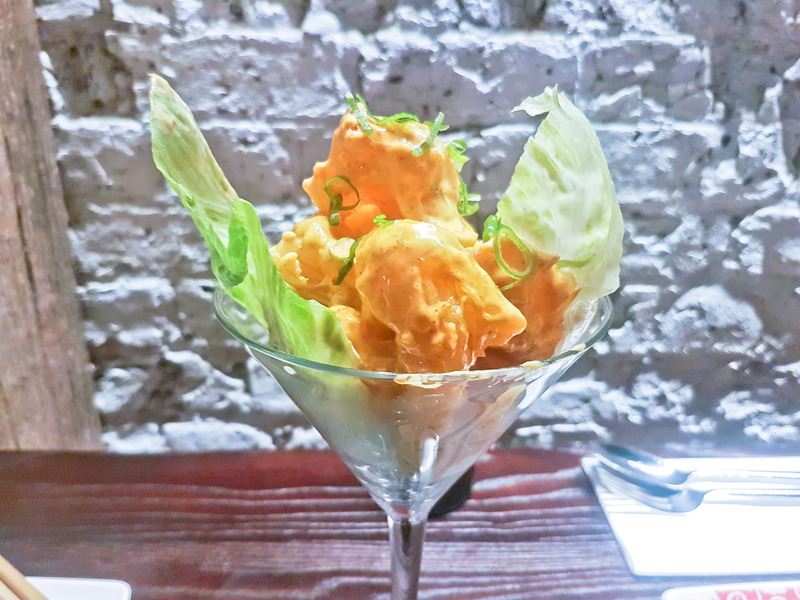 Crispy tempura battered shrimp, spicy Sriracha aioli, spring onions. A dish that surely needs no introduction for those who are familiar with trips to PF Changs in the middle east, when you walk into the restaurant you will see the majority of tables with Cocktail glasses filled to the brim with a mountain of golden battered shrimp. These are a signature dish of the restaurant and nostalgia reasons aside this is a very addictive dish. Huge, crispy tempura battered prawns that are tossed in a Sriracha Aioli ( basically a homemade mayo with a sweet but sharp Thai chilli sauce) are really addictive! The batter was crisp, the prawns juicy and the sauce was slightly spicy, yet sweet and creamy. It doesn’t have a “dynamite “ kick to it, but enough heat to please most crowds. I would say I prefer this to when I had it in Dubai. Most of you won’t agree! 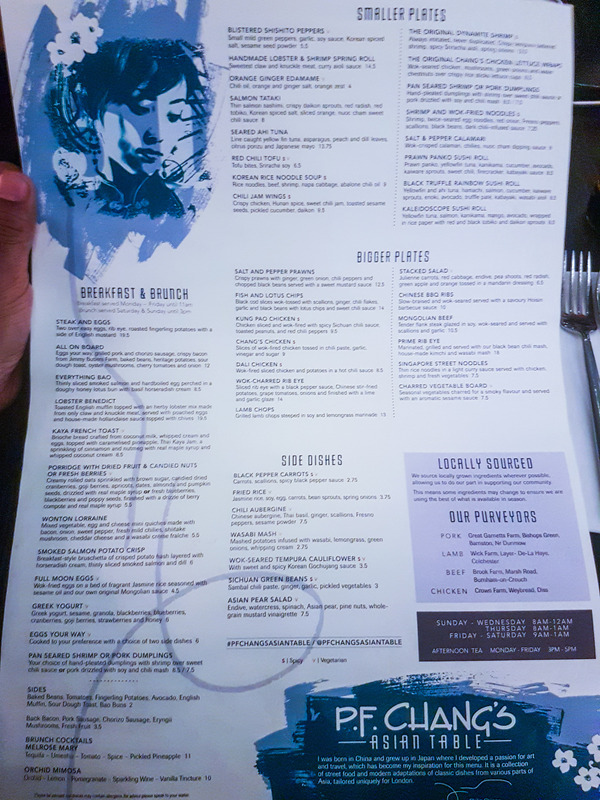 Also, another note is the price, at £12.50 PF Changs are clearly marking up a popular dish, that has seen a price increase from £10 within a matter of days of opening. Wok-seared chicken, mushrooms, green onions and water chestnuts over crispy rice sticks lettuce cups. Minced chicken wrapped up in a large lettuce wrap. The minced chicken surprisingly packed a huge amount of flavour, balancing spicy, tangy and savoury at the same time while the Wok had imparted its signature char to the chicken. 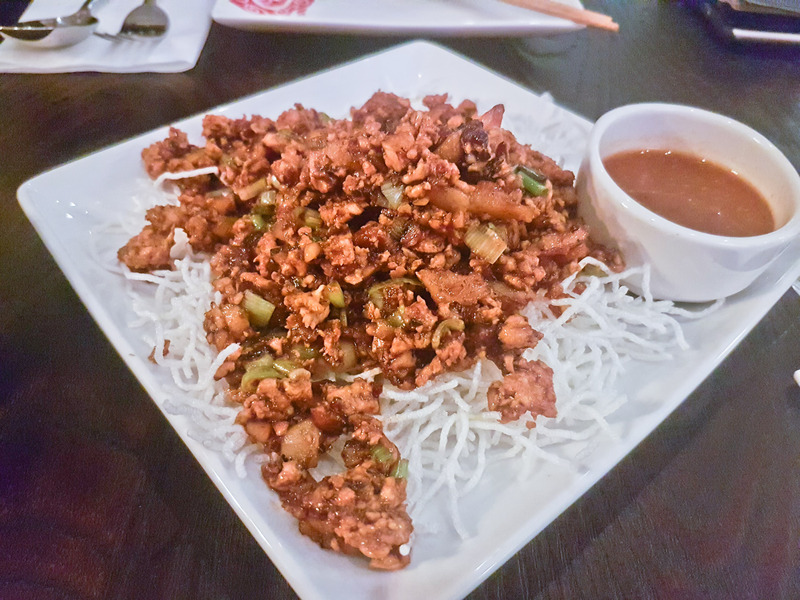 It arrived with 4 large, crisp iceberg lettuce leaves along with the minced chicken on a bed of crispy rice noodles, accompanied by a nice tangy sauce which some felt was not needed, however when added, it gave the wrap a slightly tangy/spicy flavour. Overall a very unique and tasty starter. I was really looking forward to this starter, the description had our mouths watering with a promise of the sweetest claw and knuckle meat. The plus was that it was served to the table promptly after ordering, the minus, however, was how small this dish was – for the price. 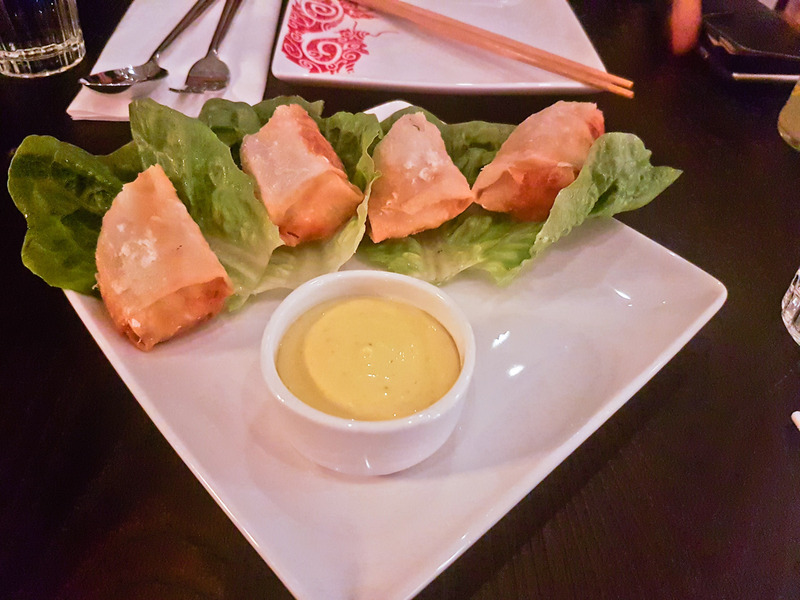 The presentation of the dish came in the form of 2 spring rolls that had been halved neatly and placed onto lettuce leaves. Unfortunately, the lettuce had softened the crispy shell of the spring roll, so I was left with a soggy shell that once bit into lacked any flavour at all and had no crunch to it whatsoever. 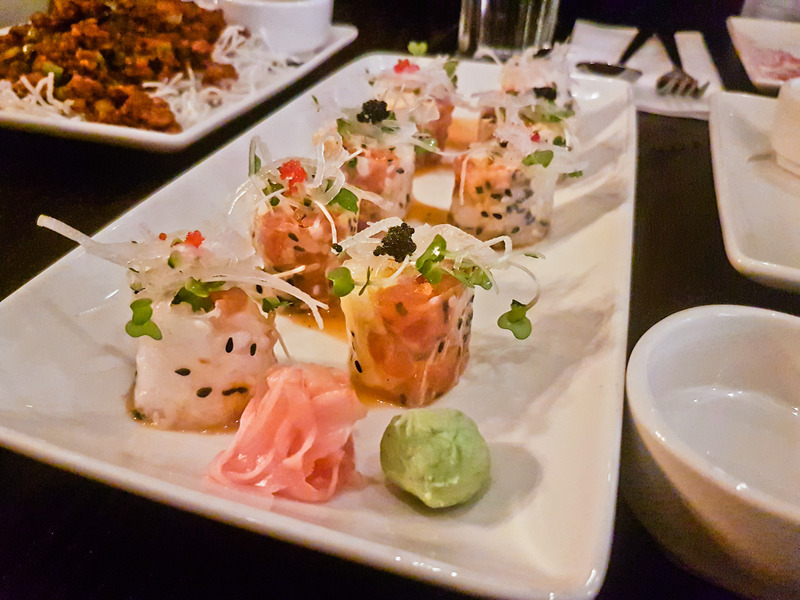 The lobster tasted fresh, but all in all, there was a lack of noticeable spices in the spring roll and unfortunately, the sauce didn’t add anything special to it – I was really left disappointed with this dish. A mix of nuts and chillies brought this dish to life and gave you a kick of spice that is appreciated by the taste buds. It did not stand alone however and requires some sort of side dish to go alongside, but it is one of the better versions made in comparison to other restaurants. A higher than the standard go-to dish for the regular Chinese takeaway eater, it is a definite one to order. The curry flavour was pungent and overpowered the dish as a whole, not to say it wasn’t an enjoyable dish. 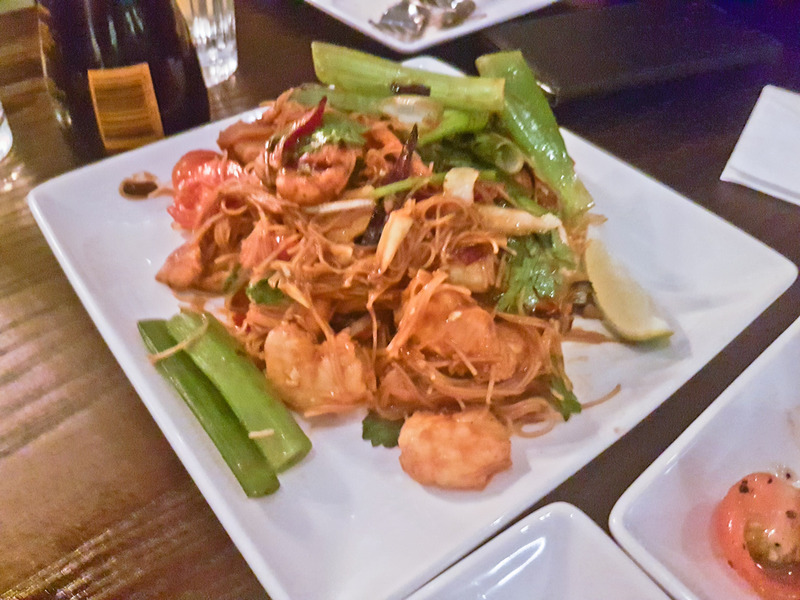 The only saving grace was the quality and freshness of the prawns they were cooked very well, but the overall flavour of the noodles didn’t work. This was probably the best main of the evening, tender flank steak, in a sweet soy glaze which was wok seared and simply served with some large pieces of spring onion. 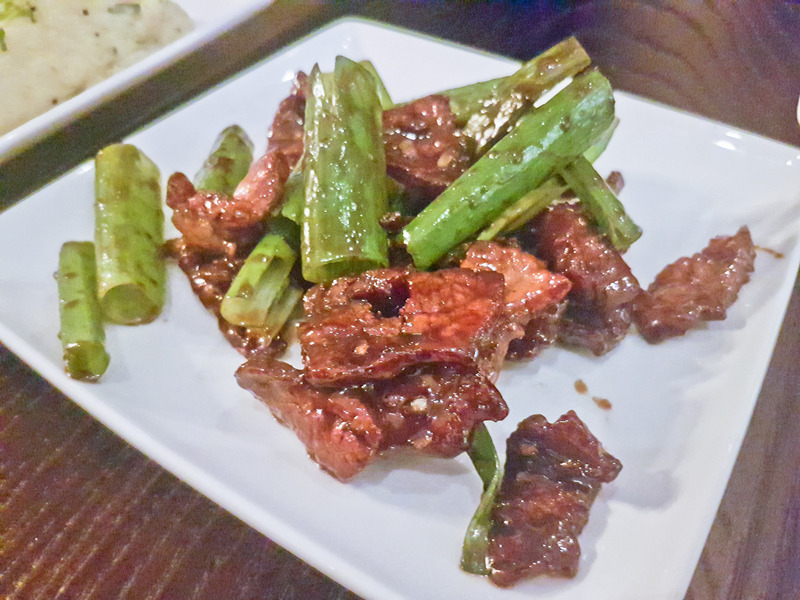 This dish is the kind of dish that has all the right flavours to make a lasting impression on your taste buds from the minute the wok-seared beef touches your tongue. Whilst the tenderness of the meat is a bit hit and miss, the flavours are faultless. The beef was cut into thin strips and the glaze was smokey and slightly sweet and gave a deep savoury flavour which worked really well with the charred pieces of flank steak and although the meat was well done, it was surprisingly much more tender than anticipated and again probably down the quality of the beef. Some of the pieces of steak were slightly chewy and overcooked, but this dish is the kind where the spices have been married so well, that you can forgive the slightly questionable promise of ‘Tender Steak’ in the description. This was more of a fusion rather than a more traditional Asian dish. It had pieces of Ribeye ( cut into cubes ) that were “Wok charred “ along with some potatoes onions and dressed with a light citrus, garlic and soy glaze. It was like a lucky dip with what type of meat you would get; some would be soft, tender and some would be well done and chewy. The potatoes were soft and accompanied the meat well. This and the ‘Wasabi Mash’ made for a complete set of its own. The mash did have lumps and you could not really taste the wasabi flavour and so for what it was sold as, it didn’t meet expectations. 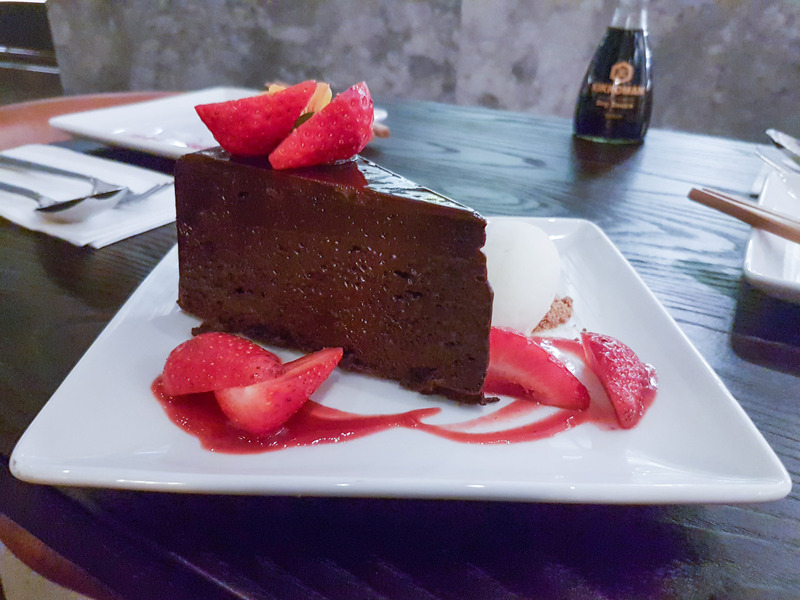 Although we had asked the waitress to make it medium, as expected since the Rib eye was cut up and cooked in a Wok it meant that there was not even cooking, so some pieces were juicy and tender, whereas some people in the group thought they had a slightly tougher piece. The quality of the beef, however, shone through and the slight tang from the lime soy marinade complimented the smokiness of the Ribeye that had a decent fat content. The potatoes and onions were both well cooked and had benefited from the glaze but overall felt a little out of place in an Asian stir-fried dish. 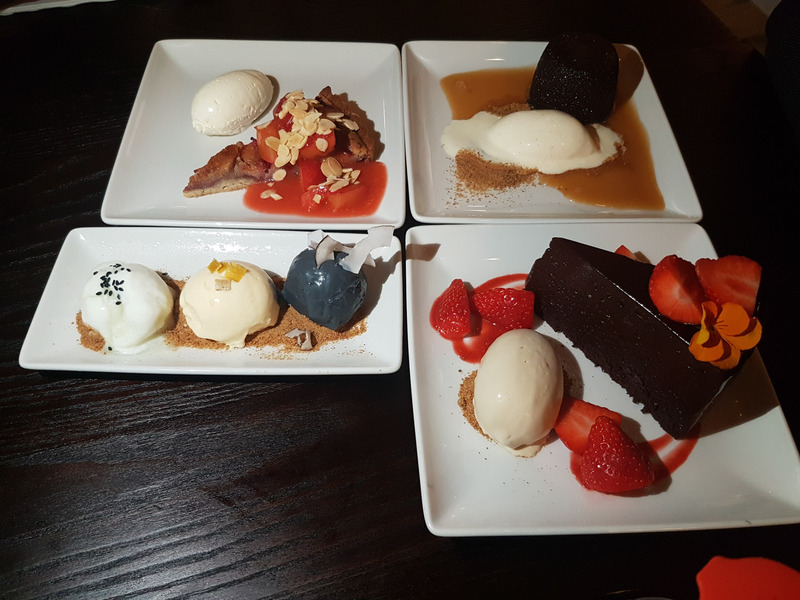 We ordered 4 desserts, save yourself the trouble DO NOT ORDER ANY DESSERTS, they were ALL AWFUL the worst I’ve ever had. Supposedly a Jam and frangipane (an Almond flavoured paste usually found in Bakewell tarts ) base with sliced cooked down plums, with plum sauce and flaked almonds looked promising on the menu. However, instead of a crisp yet soft base laced with the Almond paste with a tangy Jam running through it, all we got was a hard, undercooked stodgy base that was fairly bland and overpowered by the unripened chunks of plum that were practically uncooked. The plum sauce as well was overwhelmingly tangy and made it a very unsatisfactory dish. To sum it up, the food is expensive, the starters are good, mains okay and the desserts are awful. 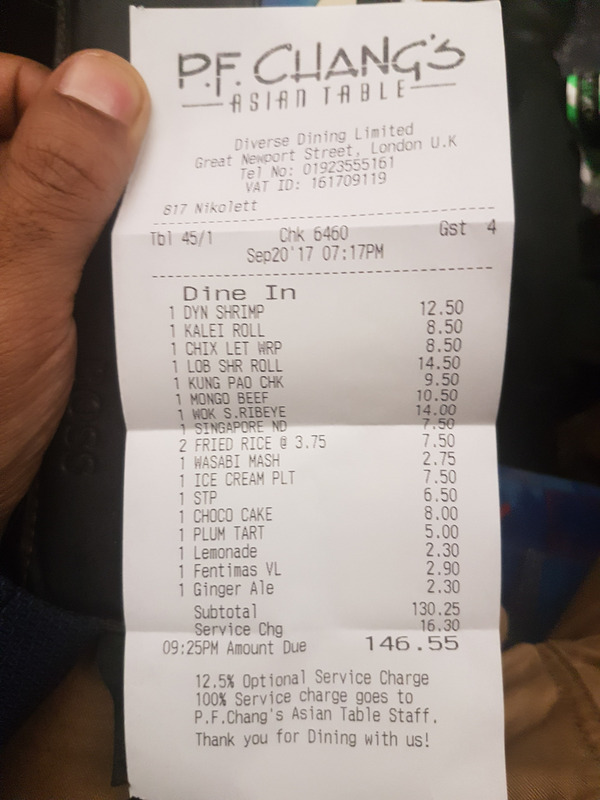 Service was odd because Food came out at different times, No mention of that when ordered. Not good if people are not sharing. Where do you purchase your halal food from? We are strictly halal food eaters only and just wanted to know if it is 100% pure halal. Please confirm. Thank you. Hey Buddy!, I found this information for you: "PF Changs". 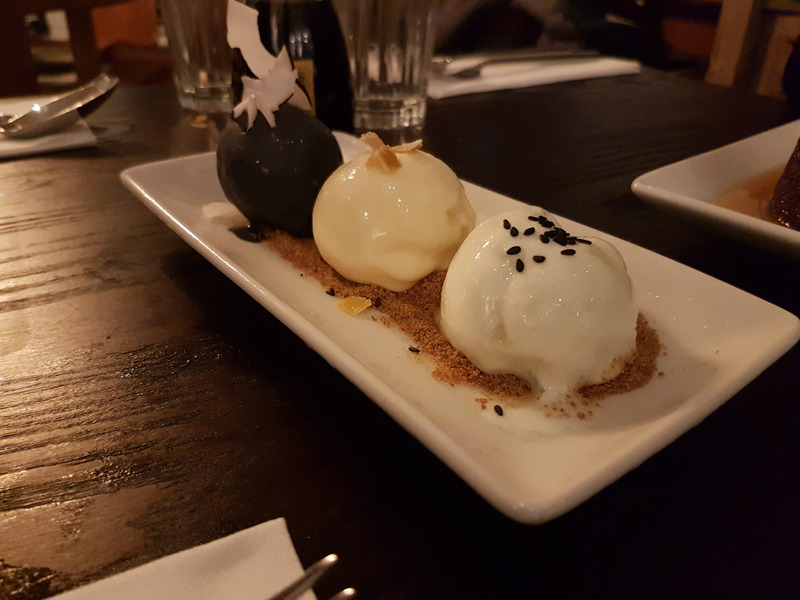 Here is the website link: http://halalfoodguy.co.uk/pf-changs/. Thank you.